Summer time and the reading is easy…..
As some of you know, before I started THE VAULT, my career was in education, as a teacher, teacher educator and a curriculum developer. A few years before my retirement, my team and I were meeting to plan a series of sessions for elementary teachers on the power of reading. At some point in our deliberations, one of the team suggested that we open a blog where teachers could share their earliest memories of becoming a reader. Each of us decided to kick it off by sharing our own story. So it was that I tapped into a number of personal narratives, secreted away within, that were just waiting to be re-visited ……. 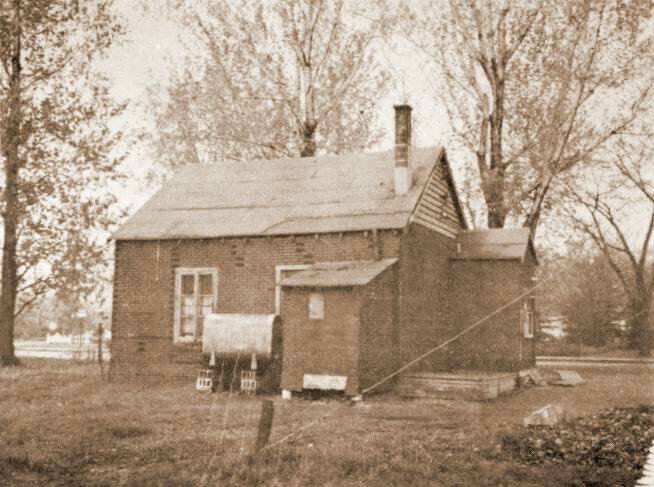 The very first Pointe Claire library, built at the end of the second World War, where I discovered a world of horses. I was a girl not yet ten, granted the intoxicating privilege of being allowed to ride my bicycle without parental supervision to visit friends and to go to the community swimming pool and library. My home had always been filled with books. Many of the books had been loved by my parents when they were children themselves and they had kept them to share with their own offspring. I had my own books too, as did my younger sister and brother. Many of my books had been Christmas or birthday gifts, since they needed to be ordered through a catalogue. There were no real bookstores in our tiny suburban community, nor in my grandparents town of Huntingdon, Quebec. 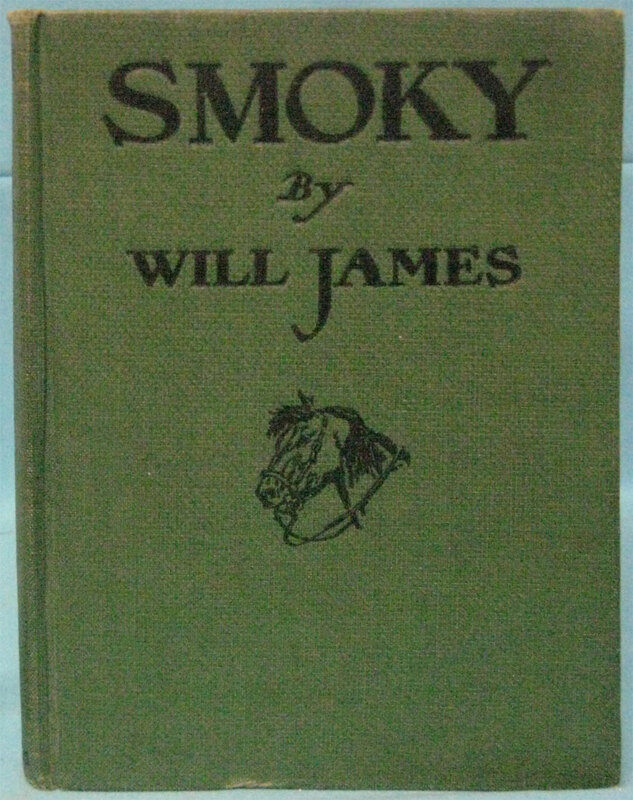 As might be guessed, I had a few horse stories that I adored and that were on permanent loan to me from my parents, whose books they had originally been: The Red Pony (Steinbeck), My Friend Flicka and a companion volume about Flicka’s son, Thunderhead (O’Hara), Black Beauty (Sewell) and Smoky (by Quebec writer, Will James). 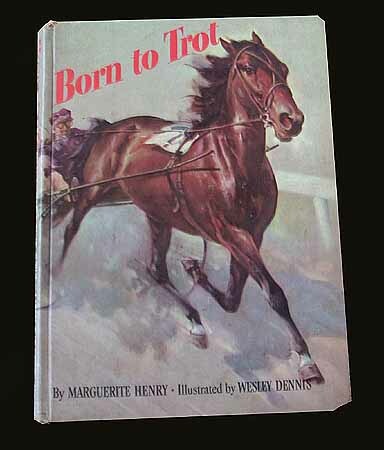 There were also a few brand-new books : An Album of Horses (Marguerite Henry), as well as Kentucky Derby Winner (Isabel McLennan McMeekin) and Strawberry Roan (Don Lang), part of the Grosset & Dunlap NY Famous Horses Series. Will James’ book included his own illustrations. I remember my first visit to the old Pointe Claire library vividly. It was early autumn and the bike ride had been invigorating. My best friend and I arrived rosy-cheeked and excited. We had money to buy a library card in our pockets and knew that an adventure lay just ahead, inside the diminutive cottage skirted by a red-gold carpet of fallen leaves. 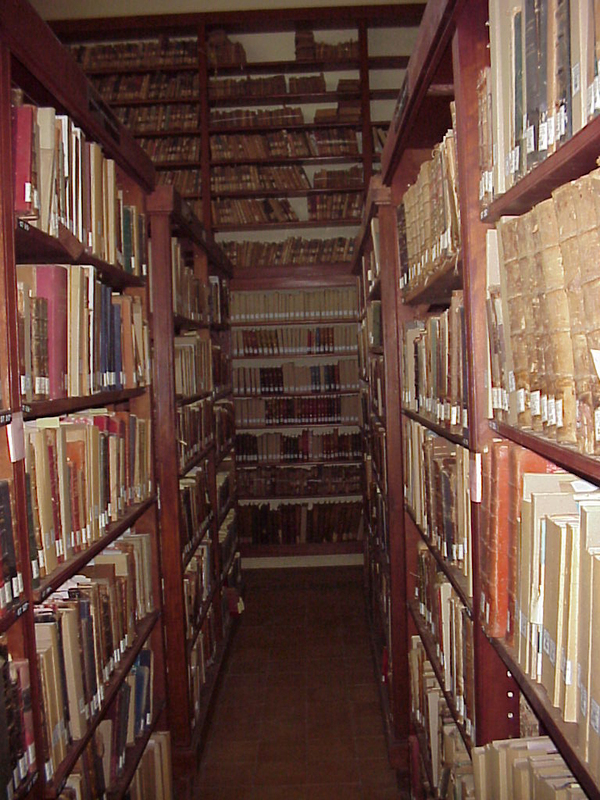 I was rather relieved, since I had imagined a place of long, book-lined rows that went on and on like a labyrinth. Small was good, too, because it was less overwhelming in terms of locating a book that I might want to read. Up the concrete steps we walked, swinging our book bags confidently. The little door was white and weathered, with a glass fan-lite we were too short to reach. Of course, it squeaked as we pushed it open. The smell of books was overwhelming…. It was rather dark inside, but it was a good dark as opposed to the scary kind — the kind of silvery light that promises the discovery of treasure. And a treasure it was. The smell of books enveloped us and through the dim light, courtesy of one tiny window, I made out silhouettes of shelves. They stood there like kindly soldiers, heavy with books of all shapes and size. But that smell of books …. a gentle, musky, organic perfume suggesting warmth and comfort. All these years later, when I am in another library or used book store and I smell that same scent, I am immediately taken back to this moment in time. The moment I learned that libraries were welcoming spaces filled with possibilities. Having arrived, our immediate concern was to determine if we were alone. Surely there was, at the very least, a librarian? We stood still before the half-dozen bookshelves and listened. A fan was whirring away somewhere, pushing around book-breath and we could just discern the soft padding of feet, coming toward us. Susan giggled nervously. Then she appeared, emerging from the wispy shadows in a single burst, as though she had been shot out of a cannon. As tiny as the building itself, she was an older lady with steel-grey hair plaited into a thick braid that was wound into a nest and pinned high on the back of her head. Teardrop-shaped glasses arched on the end of her nose. Her eyes were as green as emeralds. “Hello, girls!” she chimed, smiling warmly at us. “First time here? Let me show you how we’re organized ….” And she did a slow pirouette, leading us away with a pale beckoning hand. There were well-trodden carpets between the shelves and little stools where people could sit and short, rickety ladders for climbing up to get a book. The books were arranged alphabetically, she explained, within subject categories. Each book had a number on its spine and on the inside back cover there was a pocket. That was for the book’s library card that would carry the date on which it had to be returned. Books could be kept for 4 weeks. The world of books and book people has always been a culture all its own, and our guide lovingly introduced us to it. 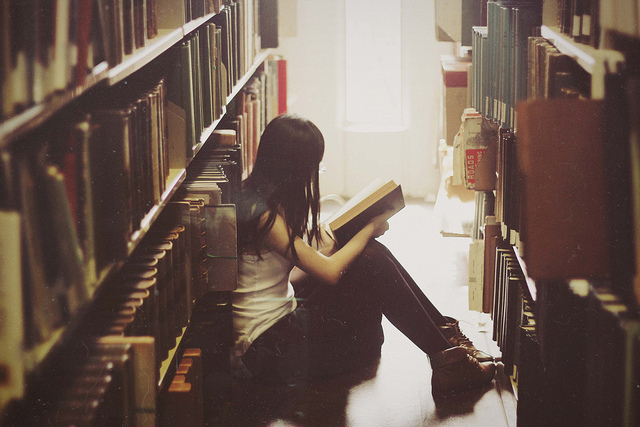 It was clear that she belonged among books and loved each and every one of them in her crowded kingdom. You could tell by the way she extricated a book, sliding it out in one, smooth sweep, by the way she cradled it in her hands and by the careful manner in which she turned the pages, holding them lightly at the top corner and then turning, very slowly. Next, we were led to a broad desk and issued our individual library card. As she printed out our names, addresses and telephone numbers at the top of each pale card, the librarian asked each of us about our reading interests. She spoke to us reader-to-reader, as though we were as grown-up as she was. We were very impressed. We hadn’t yet learned that when a reader talks to another reader, things like age don’t really matter. My first trip to the library was like finding another home. Then we were released to select the books we wanted to borrow. We headed for the children’s-young adult section and I squatted down in front of about two rows of horse books, all wrapped in a protective layer of mylar and just waiting to be chosen. I was in horsey heaven. But it was also a little overwhelming. After all, the library ran absolutely contrary to reading in my Grade 3 classroom, where the teacher picked the books and decided what was important or interesting about them without ever consulting us. The library was more like home, where I knew that I could read or reread what I wanted to read whenever I felt like reading. But my books at home were like old friends, whereas the library books seemed more like total strangers. After I had looked at the first three or four books, things improved. I began to get comfortable with the idea of exercising choice. Still…there was the matter of deciding which book(s) to take. This resulted in immediate action, first to help Susan — who, unlike me, really was in a pickle because she couldn’t think what she might want to read. 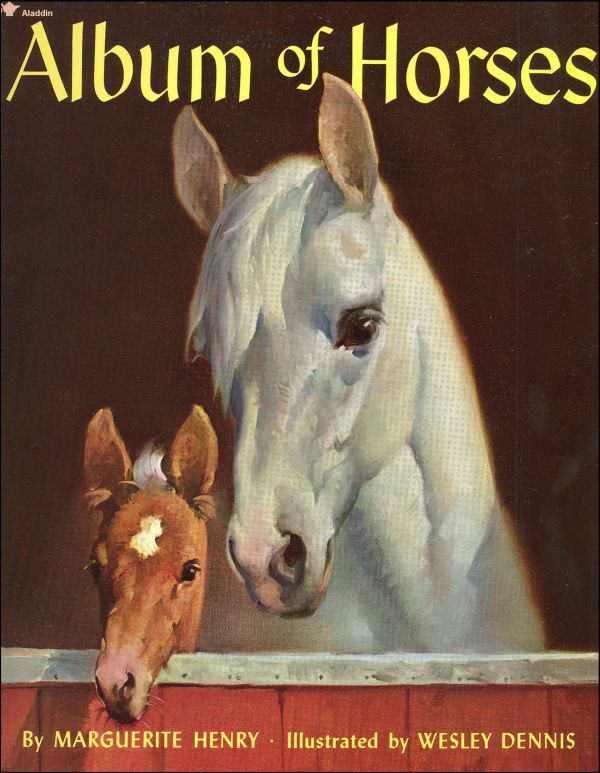 I knew that I wanted to read every book about horses there. Once Susan had chosen two or three books, the librarian moved on to me. The book I was holding was Anderson’s Salute. I may have taken other books too that day. I really don’t remember. 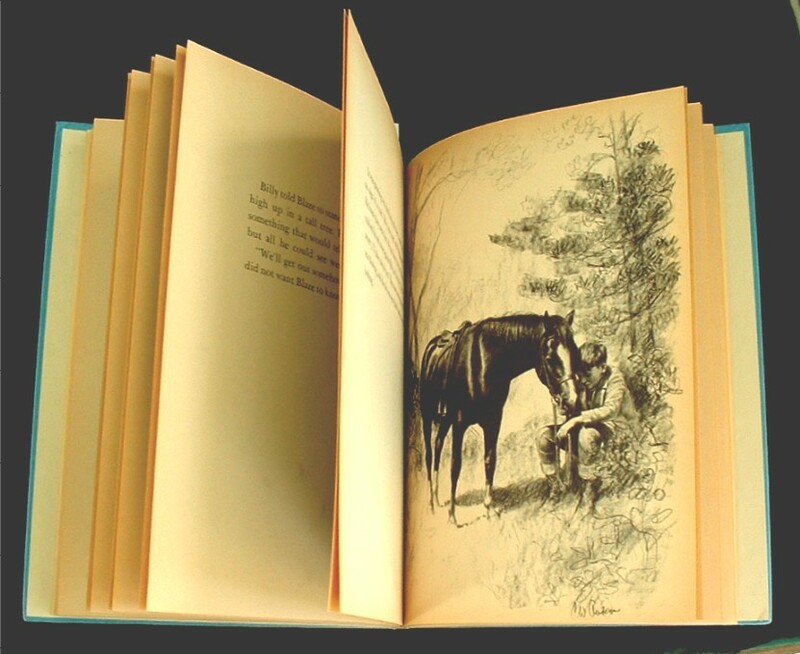 But the librarian did tell me that this was a story about someone else who just adored horses, by a writer who also illustrated his books with beautiful drawings. So it was that I was introduced to C.W. 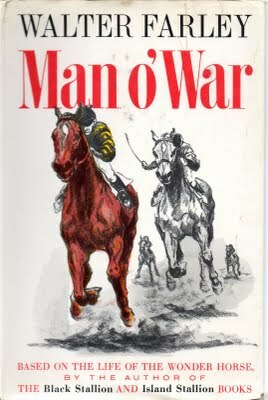 Anderson, discovering that someone else, besides my Grandpa, knew about Man O’ War. 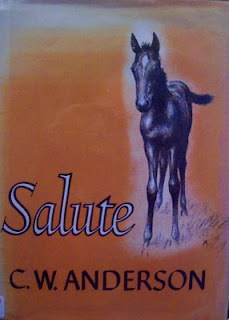 I read Salute as though it were a religious tome, savouring each line and studying each drawing as I learned about the Saratoga Cup and Man O’ War’s son, War Admiral. Best of all was Peter, the young protagonist, who seemed to be just like me. Childhood is a time of imagining possibilities and I shared many hopes and dreams with young Peter. I really didn’t want to take Salute back to the library. But return it I did, riding extra slowly up the street to the little square building. The librarian took the book from me tenderly and then flipped through her card index. “You know,” she explained, “you can renew this book if you’d like to keep it longer because no-one else has asked for it.” Be still my heart. I nodded giddily. I sat on a tiny wooden stool in the horse section, lost in CW’s world, for well over an hour. Each book was more inviting than the one before it. 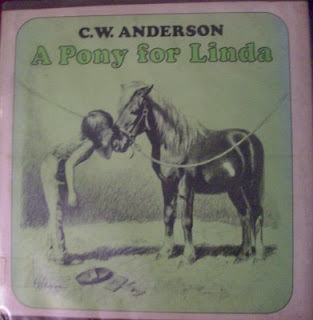 There were children like me who loved horses and stories about famous horses. And each book was filled with CW’s drawings that I could lose myself in for hours at a time. Billy and Blaze, Blaze Finds The Trail. So it was that a love affair began between CW, me and with my mentor at Pointe Claire library. At one point, the librarian explained how CW made the lithographs that illustrated all of his books. I remember thinking he must be very brave to re-do a perfect drawing on stone. Which prompted us to look together at a book on lithography. And this is how becoming a reader goes: it’s like following a footpath to an unknown destination. Sometimes there are forks in the path — times where a book or a story offers you other subjects that you want to know more about. Most serious readers I know behave this way, meandering from one author to another and following their instincts as they go. 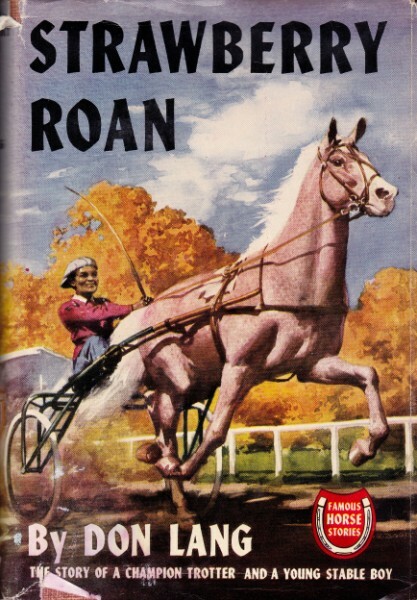 That same year, for Christmas, I received CW’s A Filly For Joan at Christmas — the CW story I loved most of all. 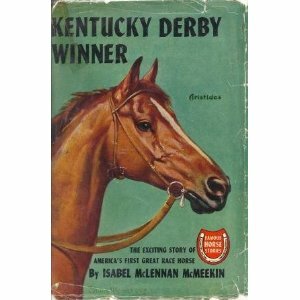 It was an irresistible blend of narrative and horse racing history. This is where I first learned about Stymie, “the people’s horse,” provoking still another talk with Grandpa who, as it turned out, was a huge Stymie fan. 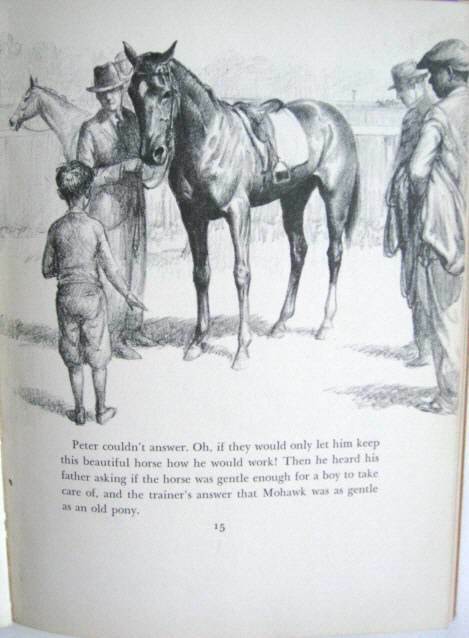 A Filly For Joan is part of my library almost 5 decades later, my name neatly printed on the inside cover. 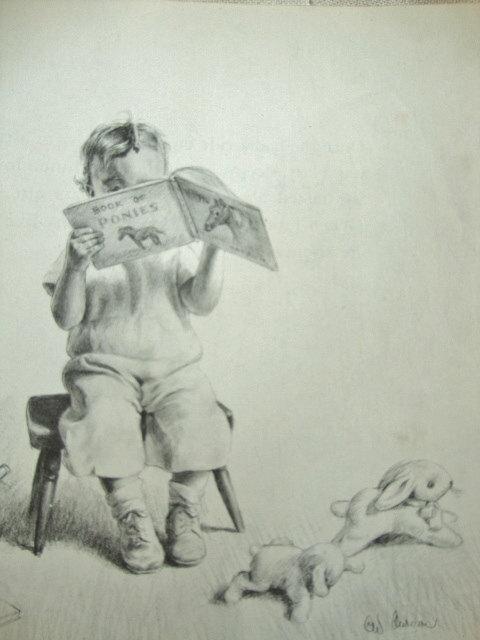 And I still take down A Filly For Joan and read bits of it, luxuriating in the drawings that I poured over as a girl and the dreams I dreamed within its pages. 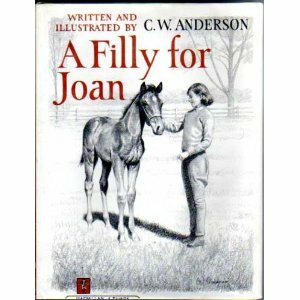 Like many of the best-loved books of our youth, A Filly For Joan is a conduit back through time in my personal life-story. 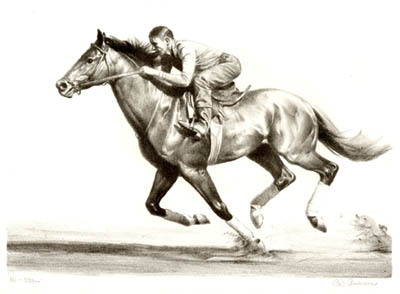 Anderson’s drawing of Native Dancer, the Grey Ghost. 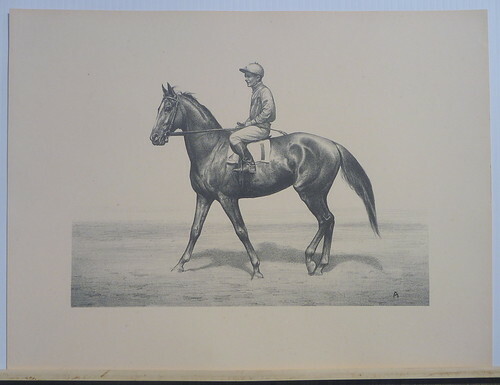 Anderson’s depiction of Triple Crown winner, Citation. The author often relied upon press photos of the day as a source for his drawings. 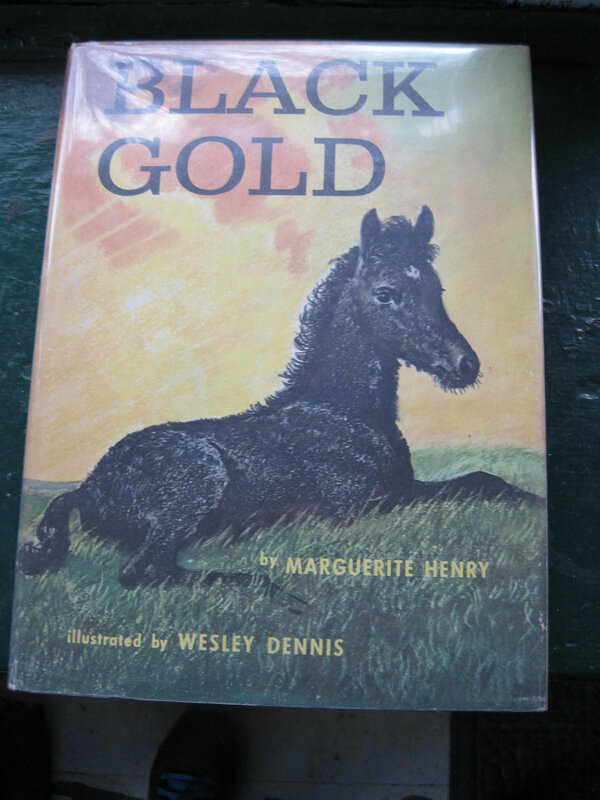 I also took out other books by Marguerite Henry, whose Album Of Horses I treasured. 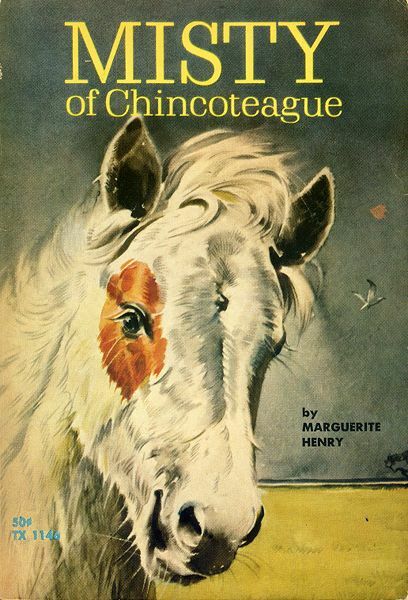 My most-loved Henry stories were Misty of Chincoteague, King Of The Wind, Born To Trot, Black Gold and Gaudenzia, Pride Of The Palio. I can’t say that I always loved Henry’s books. The narrative wasn’t always appealing to a reader of my age and I do remember finding many of her books a little too saccharine-sweet for my taste. 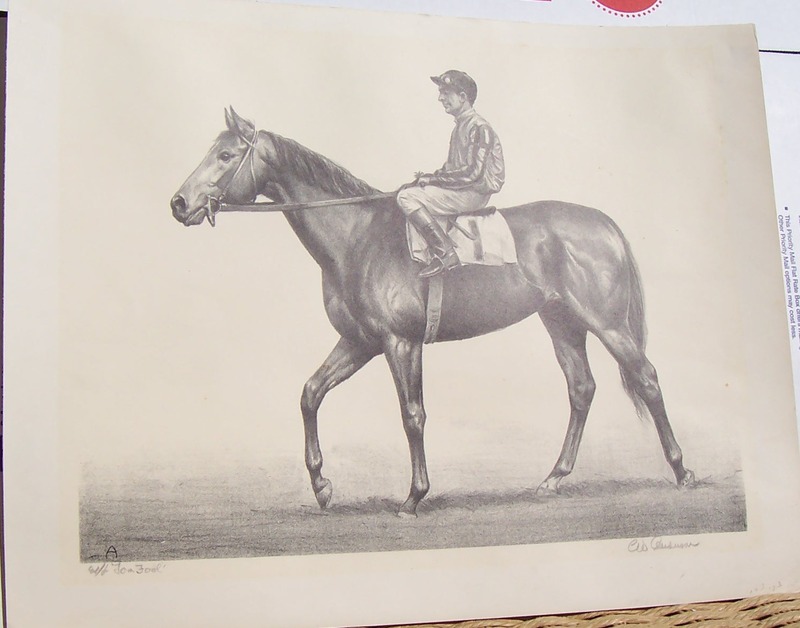 But I adored King of the Wind and it engendered a lifelong interest in the founding sires of the thoroughbred, about which they are very few books, even today. 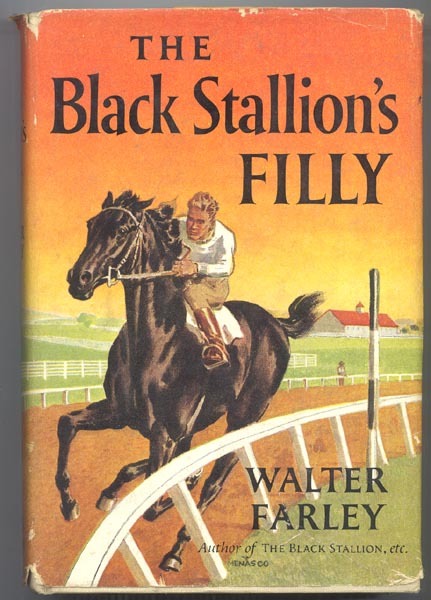 Close on Henry’s heels came Walter Farley and his Black Stallion. Right from the first page of the very first novel, I was his. As the story developed I just knew that this was one adventure I would always hold close to my heart. 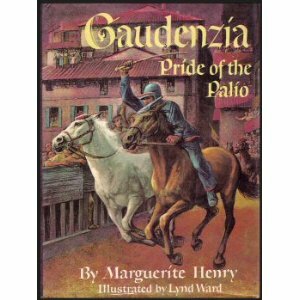 And in many ways, the appeal of the first novel in the series is based on its nod to the universality of the hero myth — separation from family, trials and obstacles and the courage that must be funded to triumph. 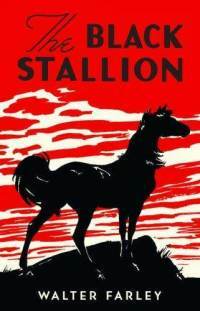 All that and the absolutely compelling relationship between a wild stallion and a young boy. Children are entranced by stories of powerful children, partly because as “little people” they are more or less helpless in overcoming the authority of adults. So it was a no-brainer that I would be enthralled. In fact, so enthused was I with Farley that, at the librarian’s suggestion, I wrote him a letter to say how much I loved The Black and his ongoing adventures and offspring. A few months went by, and then an envelope arrived with the distinctive logo of the Black Stallion in one corner. My mother presented it to me ceremoniously. The letter had 4 typed paragraphs, but there, at the end, was Walter Farley’s signature! By the time I’d finished reading, I had learned another invaluable lesson: writing matters because it does important things in the world. 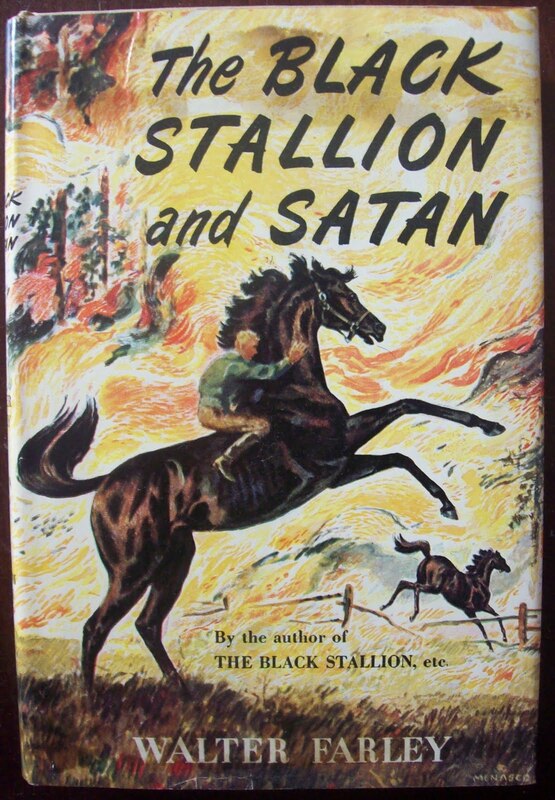 The artist Milton Menasco illustrated this Farley book, as well as The Black Stallion’s Filly (below). 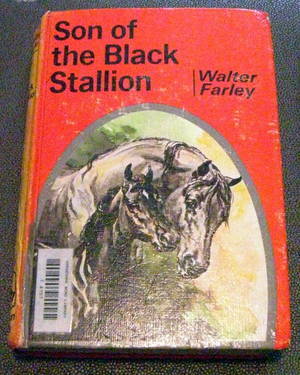 Next to The Black Stallion, I loved this Farley book most of all. It was a Christmas present, from my parents, who were obviously keenly following my reading interests! Of course, all of these (modest) book adventures as a girl engendered the reader I became. I am one of those people who regard my books as part of the decor of my life, even as I bemoan their numbers — or the book shelves that have shattered under their weight. I belong to the wrong generation to ever give them up for a Kindle. I love their smell, turning their pages, getting lost in their narratives and rememorying how each one came into my life and what it meant to me at the time. My books frame chapters in a life. But the “horse books” of my youth came with a special promise and I doubt that there would be THE VAULT had they never existed. I would also never have learned how to write without them, since reading teaches us how to write. And the books that inspire pour into the budding writer’s repertoire. This is why authors tend to suspend their reading until after the text they’re working on is done. 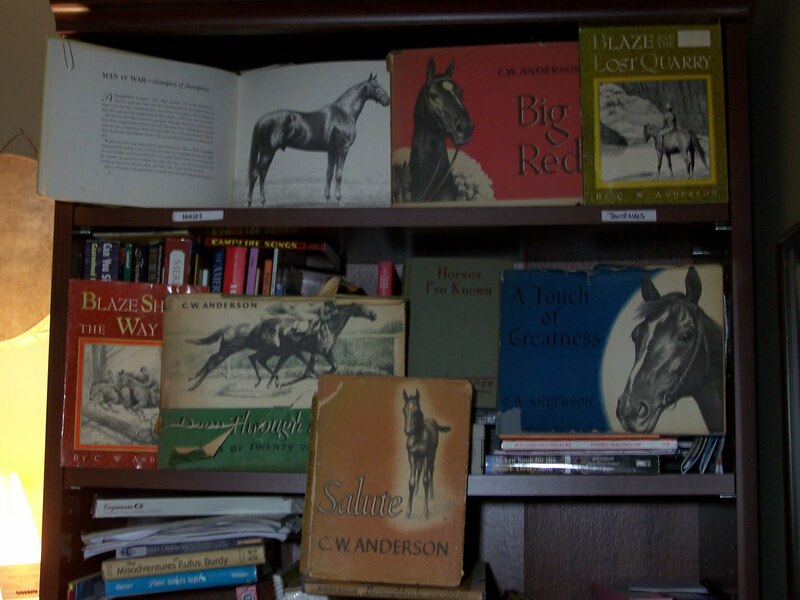 Too, without my “friends” CW, Marguerite Henry and Walter Farley, as well as the authors of the Famous Horses Series, my passion for the horse would have fallen on barren ground. Like my Grandpa and that wonderful librarian, their beingness led to characters that nurtured me and opened windows of possibility. After all, we never know real people — or real horses — as intimately as we come to know them in a book. As fate would have it, when I was first married and my son was a newborn, we lived in Pointe Claire, near a new branch of the Pointe Claire library that was located at Stewart Hall. On a mild day, I bundled up baby James and walked over to Stewart Hall to take out something to read. Once inside, I laid down my infant son on one of the library tables to open up his winter bunting. As I was taking off his little wool hat, a voice said, “Oh, my, what a beautiful baby!” And I turned to find the mentor of my youth, her hair white but eyes still sparkling out their immeasurable warmth, standing at my side. I filled up with tears and to her “Oh my dear” began to cry.